Mobikwik - Online Recharge platform is offering Flat 200% Cashback on First Time Add Money using the special promo code. This offer is valid for only new or first time users. Minimum amount required to redeem this offer is Rs.10. How To Get Free 200% Cashback on Adding of Money? • Complete the payment & You will get free Rs.Rs.80 in your Mobikwik wallet. 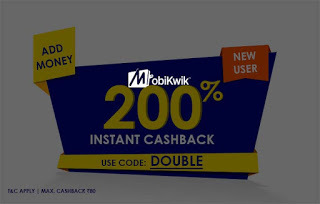 - Get 200% Cashback on Add Money done on MobiKwik App. - Maximum Cashback amount is fixed at Rs.80. - Coupon redemption & Payment should be done on MobiKwik's Android, Windows & iOS App.